Home > Problems > Can I Have an Affordable Green Home? The environment and energy saving issues are high on the government’s agenda at present and it is looking for ways to entice people into making their homes more energy efficient or as many refer to it “green”. For most people, especially first-time buyers their biggest concern is getting any kind of footing on the housing ladder and considerations such as whether the property is environmentally friendly are not high on the priority list.But if you are willing to put in a little bit of extra work, opting for an energy efficient home could pay off. 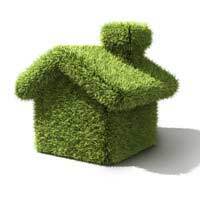 Not all mortgage lenders are yet to embrace the idea of green mortgages and only a few offer such schemes. The Ecology Building Society is the most well-known lender to offer this type of borrowing with some others such as the Co-Operative, Hanley Building Society and Norwich & Peterborough and the Teachers Building Society also offering a service in this arena. Lenders such as the Ecology Building Society will specialise in lending on properties such as farms, timber buildings, renovation projects, disused buildings that need converting and eco new builds, where a property has been built using stainable materials. Each lender will have their own unique selling point when it comes to offering you a mortgage, many will plant a certain number of trees based on who much you borrow, while others will donate to an environmentally friendly charity or take a proportion of your mortgage payment each month and give it to a charity. Lenders offering green mortgages will often offer very competitive rates and offer you extra benefits such as no early repayment charges, higher loan-to-values or lower interest rates. Once you are in the property you should also have reduced energy costs because of your eco friendly home. The main cost involved in your green home will be building or constructing it. For example if you choose to convert a disused property using only sustainable materials, this is going to be more costly and time consuming than buying a one-bedroom flat. You will ultimately be saving money by building an eco-friendly home, but it is likely you will need to stump up some cash beforehand. Are Green Mortgages Set To Become More Affordable? Unfortunately green mortgages have not yet taken off in the UK and some lenders are still reluctant to dip their toe into the market. There are however a number of initiatives being worked on to try and combat this problem. The Energy Efficiency Partnership for Homes has set up a home purchase and finance group to look at environmentally friendly mortgage lending. It is pushing for lenders to offer a range of incentives to make these deals more appealing, such as cash back offers and a lower interest rate. In order to receive the incentives the borrower must carry out a range of measures to the property such as cavity wall or roof insulation and meet a set standard of energy efficiency. There are other wider schemes, such as the Green Deal, which was launched by the government in December 2010. As part of the deal homeowners are allowed to install energy efficient measures into their home and fund these through their energy bill, instead of taking a further advance on their mortgage. It has however been suggested that the best way lenders can accommodate aspiring green homeowners is to relax their criteria around lending to those who wish to carry out energy efficient home improvements. So while a lender may refuse you a further advance to re-do your kitchen, they may be more willing to offer you the money to install solar panels or cavity wall insulation. There are many ways to make your ideal home both beneficial to you and the environment, especially if you are able to start from scratch or start a renovation project. If your finances mean you have to buy a property that is currently not kind to the environment, carrying out small measures over time can convert it and save you money in the long-run.